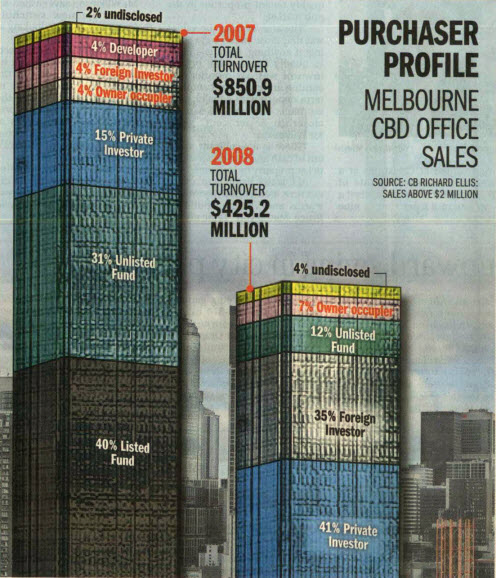 As a result of the global financial crisis … sales of Melbourne CBD Offices fell in 2008 (to $425.2m) from the level achieved in 2007 (of $850.9m) — according to research released by CBRE. Institutional buyers and REITs have virtually withdrawn from the market … leaving private syndicates, wealthy families and overseas buyers to transact most of the deals. Bring along your Friend, Spouse or Partner? 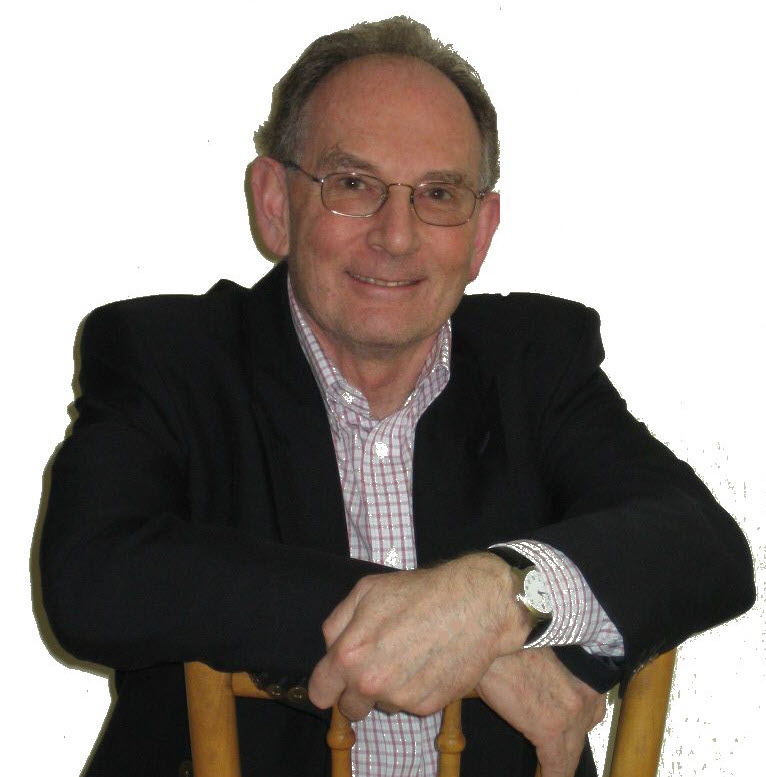 The question has been raised as to whether you could bring along a “significant other” with you to attend the full-day Workshop on Saturday 4 April? But given the turbulent times, I’m happy to play my part in helping you out. Simply enrol yourself and you can then bring along your “Investment Partner” absolutely FREE. That’s how serious I am about seeing you gain the upper hand in the current market. An earlier post outlined my view on how the various CBD Office Markets would perform around Australia. And a report by the ANZ Bank (in yesterday’s Financial Review) pretty much confirmed that previous advice. 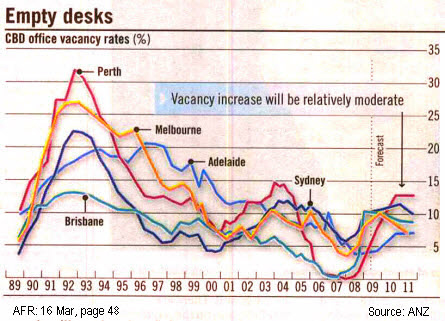 Interestingly, their take on the level of vacancies is that it will not reach anything as bad as the 1990s. 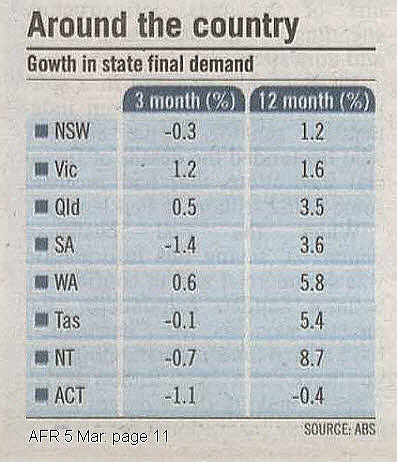 But Perth, Brisbane and Sydney will be the most affected … and slowest to recover. The pent-up demand for housing serves to underline that this downturn is more like the credit squeeze of the mid-1970s, than the recession of the early 1990s. It’s principally a confidence thing. 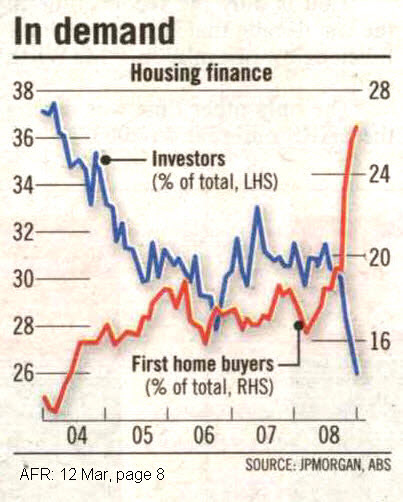 However, the recent surge in purchases by first-home buyers confirms that with the encouragement of low interest rates and government hand-outs … the buyers will play their part. More importantly, the flow-on effect throughout the construction industry will give our economy a much needed lift. Victoria may not have grown as fast as Queensland and WA over the whole of 2008. However, it far outstripped every other State for the December — once the full impact of the global turmoil had started to take effect. And as mentioned in an earlier posting … the positive impact of the Bush Fire Relief funds will certainly help to shore up Victoria’s position even further.